Surrounded by majestic mountain views and emerald green fairways of the TPC Scottsdale Champions Golf Course, Scottsdale Marriott at McDowell Mountains defines luxury in the heart of the Sonoran Desert. As you walk among the palms or relax on your private balcony in your spacious 575 square-foot guest room suite, you are treated to an ever-changing panorama of daytime mountain ranges and star-filled nighttime skies. 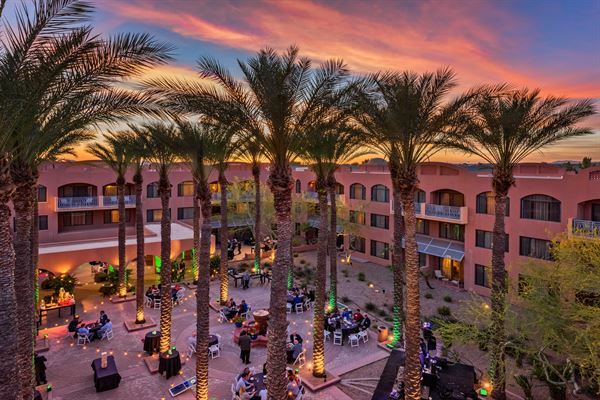 Scottsdale Marriott at McDowell Mountains offers 15,000sq.ft of event space, featuring multiple outdoor Ceremony & Reception Sites and newly renovated Ballrooms for Dinner & Dancing. At the Scottsdale Marriott McDowell Mountains, it is the unexpected touches and our personalized services that will make your Event memorable. Our talented culinary team emphasizes innovative banquet selections with creative menus and unique presentations. Our resourceful Certified Event Planners are dedicated to impeccable performance, supporting you with a skilled staff devoted to making your event a Triumphant Success! Ceremony Packages Include: • Ceremony Rehearsal including Tray Passed Champagne, Fruit Infused Iced Water and Chef’s Choice of Assorted Hors D’oeuvres for up to 10 guests • Ceremony Event Space (Reserved Indoor Location for Inclement Weather) • White Garden Chairs for Ceremony • Water Station with Fresh Garnish • Rose Petals and Candle Votives • Gift and Guest Book Table • Outdoor Sound System with Microphone & Technician Assistance • Two (2) Suites to be used as Changing Rooms with Celebration Amenities Provided • One (1) Premium View Honeymoon Suite Accommodations for Couple on night of wedding with Congratulations Amenity • Complimentary Self-Parking for Your Guests • Marriott Wedding Certified On-Site Event Manager Ceremony Fee • Lawn Ceremony | $1,500 • Desert Sunset Ceremony (Splash Patio) | $2,000 • McDowell Mountains Ceremony | $3,000 *Pricing will vary depending on the location selected and time frame needed; please consult with your Catering Sales Executive for availability and pricing. Please see attached PDF for additional information. Ensuring a fairytale beginning to your happily ever after starts with the all-important rehearsal. We are pleased to include complimentary tray-passed champagne, fruit infused iced water and chef’s choice of assorted hors d’oeuvres for up to 10 guests upon conclusion of your rehearsal. We also have exciting options to extend the festivities with a fun and casual rehearsal dinner to welcome guests from near and far. Please see attached PDF for Rehearsal Dinner menu options. Our hotel offers an idyllic backdrop for your guests on your special day. Our magnificent Mediterranean architecture with its backdrop of lush greens, rolling fairways and breathtaking views of the rose-hued McDowell Mountains is the perfect space for an incredible weekend. With a variety of landscaped lawns, festive patios, an outdoor fireplace and expansive terraces, we present a unique setting for the wedding of your dreams. Reception Package Includes: • Lounge Style Seating with Tall and Short Cocktail Tables • Banquet Round Tables and Chairs • Hotel 8 pt. Linens & Napkins in White, Black, Burgundy, or Ivory • Glassware, Silver Flatware, White China • White Candles in Hurricane Glasses and Votive Candles (3 per table) • Table Numbers • Choice of Head Table or Sweetheart Table Style • Custom Size Wood Parquet Dance Floor • DJ Table • Riser for band or Headtable/Sweetheart Table • Gift and Guestbook Tables • Place Card Table • Cake Table with Cake-Cutting Service • Buffet Tables if Required • Hosted Taste Panel for Wedding Couple and Two Additional Guests • Marriott Rewards Points Please see attached PDF for additional information and menu options.